DMitry( ( Deepmagic Information Gathering Tool ) is created by James Greig . To use help option , enter the command given below . 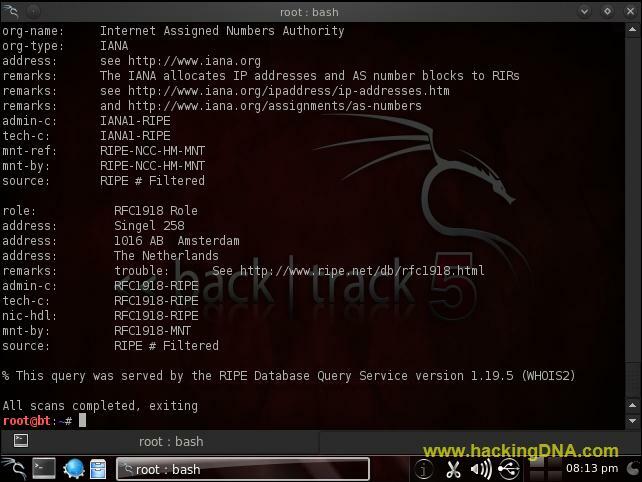 Perform an Internet Number whois lookup on the target. This requires that the target be in the form of a 4 part Internet Number with each octal seperated using the '.' notation. For example, "dmitry -i 255.255.255.255". Perform a whois lookup on the 'host' target. This requires that the target be in a named character format. For example, "./dmitry -w target" will perform a standard named whois lookup. Retrieve netcraft.com data concerning the host, this includes Operating System, Web Server release and UpTime information where available. Perform a SubDomain search on the specified target. This will use serveral search engines to attempt to locate sub-domains in the form of sub.target. There is no set limit to the level of sub-domain that can be located, however, there is a maximum string length of 40 characters (NCOL 40) to limit memory usage. Possible subdomains are then reversed to an IP address, if this comes back positive then the resulting subdomain is listed. However, if the host uses an asterisk in their DNS records all resolve subdomains will come back positive. Perform an EmailAddress search on the specified target. This option will cause the TCP Portscan module to report/display output of filtered ports. These are usually ports that have been filtered and/or closed by a firewall at the specified host/target. This option requires that the '-p' option be passed as a previous option. For example, "dmitry -pf target". This option will cause the TCP Portscan module to output Banners if they are received when scanning TCP Ports. This option requres that the '-p' option be passed as a previous option. This sets the Time To Live (TTL) of the Portscan module when scanning individual ports. This is set to 2 seconds by default. This is usually required when scanning a host that has a firewall and/or has filtered ports which can slow a scan down. Create an ascii text output of the results to the "filename" specified. If this option is not specified in any form output will be sent to the standard output (STDOUT) by default.